Ever since it hit theaters 30 years ago, Disney’s The Little Mermaid has been a favorite among viewers of many generations. But the story, about a 16-year-old mermaid named Ariel who sells her voice for human legs so that she can pursue the man she loves, has been met with fierce debate in recent years. Some writers have called it "a feminist’s worst nightmare," while others say it "promotes feminism." To put it simply, The Little Mermaid is divisive. And the voice of Ariel herself, Jodi Benson, has her own thoughts on the matter. "You have to take in the perspective of where we were in 1989," Benson says, speaking over the phone recently. "The previous princess was Sleeping Beauty in 1959. There’s a big leap between Sleeping Beauty and Ariel. Would we have jumped from Sleeping Beauty to 2019? I don’t know." The fact that Ariel is "stubborn, she’s strong willed, she lives outside of the box, she dreams big, she believes in the impossible, she’s tenacious," and that she’s "saving Eric from his death, dragging him up onto the beach, being defiant of her father, not fitting in the box like her sisters, being determined," makes Ariel a jumping off point for what we expect of today’s Disney princesses, says Benson. Without Ariel, she explains, we wouldn’t have advanced to Belle, to Jasmine, to Pocahontas, to Mulan, to Tiana, to Rapunzel, to Merida, and to Elsa. It’s because of Ariel that those other princesses were allowed to evolve. Says Benson, "We did come a long way." When Benson won the role of Ariel, she was fresh off the Broadway stage, where The Little Mermaid‘s lyricist Howard Ashman had directed her in the 1986 musical Smile. Yet transitioning to the princess wasn’t easy, as the actor was trained to fill a theater with her big, powerful voice but needed to scale back for Ariel. "I have to admit it was really frustrating for me because I really wanted to sing the crap out of it," she recalls. "It was really overwhelming to create something with just my voice instead of with the rest of my body." While recording the iconic number "Part of Your World," Benson was having trouble getting exactly what the filmmakers wanted, so Ashman decided to make the room dark. "That’s when he got the idea to turn the lights out and leave me alone in my grotto, forget about everything else that was going on around me, and just create this moment," says Benson. In the behind the scenes clip below from The Little Mermaid‘s 30th anniversary Blu-ray, it’s clear that the singer has a huge voice, and that the darkness of her environment did help her get more into character. 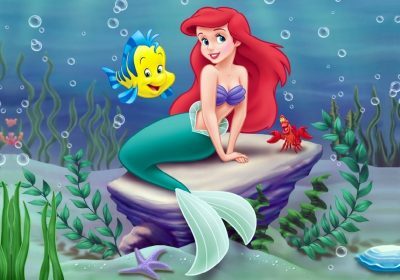 Thirty years later, with The Little Mermaid considered a classic that ushered in the Disney Rennaissance of the ’90s, Benson calls voicing Ariel a "life-altering path." She had intended to spend her career on the stage, but instead has worked behind the microphone with Disney for three decades, voicing Ariel in a number of sequels, video games, and appearances in other films, like Wreck-It Ralph 2. She’s also taken on the voice of Barbie in the Toy Story films and in numerous other Disney projects. "I had two roads and I took the one less traveled. So this is a different destination, a different trajectory than what I had anticipated, but it has been the most joyous ride," Benson says. Benson also credits Ashman, who passed away in 1991 from complications due to AIDS, as, "the number one reason for Disney animation coming back to life." His insistence on working with composer Allen Menken, and making The Little Mermaid feel like a Broadway show, according to Benson, "changed the course of animation forever." His decisions made the film "witty and smart and age appropriate for all ages," she adds. "So it’s pretty amazing to be a part of something that is so very very important." Benson also enjoys talking to fans, of which The Little Mermaid, so many years after its release, still has many. "One of my favorite things, as time goes on, is hearing the stories about where everybody was the first time they saw the movie," she says. "Because if it meant something to them, they have really vivid memories of who was with them, what they felt like, and what the experience was." For many millennials, in particular, Ariel was their first exposure to Disney princess culture, but for Benson, another character shaped her childhood. "I could really relate to Cinderella because she was in an impossible situation," says the artist. "[She was] going through some angst and some suffering and some pain and some difficulty, but being tenacious, being motivated, and still trying to have a happy heart through it. And she comes out on the other side OK."
Princesses can definitely be role models, a fact of which Benson is understandably proud. "Anyone who can have a princess to identify with at a birthday party or in a costume or whatever it might be, that’s pretty special," she says. Millions of people would happily agree.